Investors started 2018 full of hope, with the global economy and financial markets in good shape, but by year’s end they were uncertain and a little anxious about what lay ahead. Markets responded with last minute falls across all asset classes. 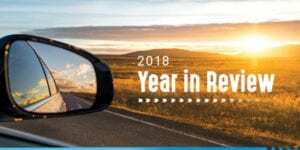 The issues that weighed heavily at the end of 2018 were the unresolved trade dispute between the US and China, confusion over the final Brexit deal, rising US interest rates, falling oil and commodity prices and the US government shutdown. Australians were also distracted by political instability and falling house prices in Sydney and Melbourne. With so much focus on what may, or may not, lie ahead, it was easy to lose sight of the solid progress we’ve made. The US economy continued its strong recovery with growth of 3 per cent in the year to September. Australia enjoyed steady growth of 2.8 per cent in the year to September as we notched up a world-beating 27 years without recession. Corporate profits are at record levels, inflation is a tame 1.9 per cent and unemployment fell to 5.1 per cent. While wages growth of 2.3 per cent was an improvement, it’s still well below the 20-year average of 3.25 per cent. 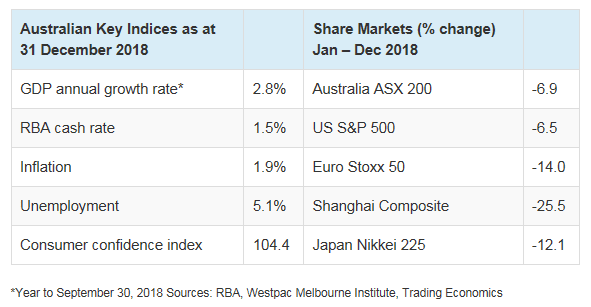 The Australian dollar fell 10 per cent in 2018 to finish at US70c, due largely to US dollar strength and a widening of the gap between local and US interest rates. High US interest rates increase the global cost of borrowing and boost the value of the greenback. The US Federal Reserve lifted rates four times to 2.5 per cent but indicated there may be only two more hikes in 2019, rather than three as previously forecast, due to the slowing economy. By contrast, Australia’s cash rate finished the year where it started at 1.5 per cent. The lower dollar is good news for our exporters and should soften the impact of falling commodity prices which have been caught in the cross-hairs of trade wars and fears about an economic slowdown. The heat came out of Australia’s residential property market in 2018, with big falls in Sydney and Melbourne dragging the national market down 4.8 per cent according to figures from CoreLogic.vii This is the biggest annual fall in a decade and follows tighter lending practices, rising supply, higher mortgage interest rate and falling investor demand. After rental income is included, the annual return from property was down 1.2 per cent. The late market reversals of 2018 were driven by gloomy expectations rather than the reality of solid economic progress. Future performance will depend on US interest rates, the resolution of trade tensions between the US and China and, to a lesser extent, the negotiation of a workable Brexit. In Australia, uncertainty will persist until the Federal election is out of the way. Then investors can get back to focusing on fundamentals such as our solid economic growth, a strong corporate sector, resilient consumers, low interest rates and more affordable housing.